1 of 2 In a medium bowl, whisk flour, baking powder and salt. In a large bowl, beat butter, crushed candies and sugar until blended. Beat in egg. On low speed, beat in flour mixture. Gather dough with your hands and divide in half. Flatten each half into a disk and wrap in plastic. Refrigerate overnight. 2 of 2 Heat oven to 350 degrees . Let dough stand 10 minutes at room temperature. Line 2 baking sheets with parchment paper. On a floured surface, roll out one disk to 1/8- to 1/4-inch thickness. 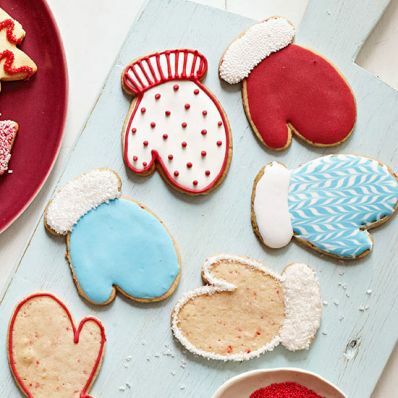 Cut out mittens with cookie cutter. Transfer to prepared sheets. Re-roll scraps, cutting as many mittens as possible. Bake at 350 degrees for 11 minutes. Transfer to a wire rack to cool; repeat with all dough. 1 of 2 In a bowl, combine confectioners' sugar and water. Beat until smooth. If desired, transfer 1/4 cup of the frosting into each of 2 bowls. Tint to desired colors. 2 of 2 Spread a scant 2 tsp frosting onto each cookie. Top with sparkling sugar or nonpareils, or decorate with colored frosting. Let dry completely before stacking cookies.